Redwood City – “Weather Best by Government Test”! This is a community that believes in working together to maintain and improve its quality of life. The city council of Redwood City formally adopted a “core purpose” – Build a Great Community Together. Bordering San Carlos to the north and Menlo Park to the south, Redwood City is 19 square miles in land area and 15 feet above sea level with a population of approximately 76,800. With easy freeway access, Redwood City extends from San Francisco Bay to the hillsides of the Santa Cruz Mountains. The Port of Redwood City is the only deep water port on the San Francisco Bay south of San Francisco. Redwood City is a community combined of residential, industrial and commercial elements in a largely urban environment. 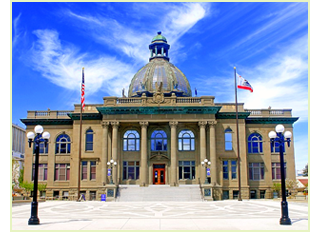 Redwood City is the County Seat for San Mateo County and home of the County Courthouse, Hall of Records and county jail. Redwood City enjoys a vibrant downtown including a Cinema Theater complex, shopping center, shopping and fine restaurants. Hiking trails, open space and large parks are well maintained and centrally located. The success and health of Redwood City has been built upon it diverse communities, civic pride, strong neighborhoods and each individual’s sense of responsibility for making Redwood City a better place for everyone. Redwood City is proud of diversity, which brings a wide range and a great depth of skills, experience and interest to the city’s continual efforts to improve its community.